The ReadyLink EtherNet/IP LDT with RapidRecall is our newest Linear Displacement Transducer (LDT) developed with an EtherNet/IP network interface. EtherNet/IP systems require only a single point network connection for both configuration and control, thus simplifying installation and wiring. 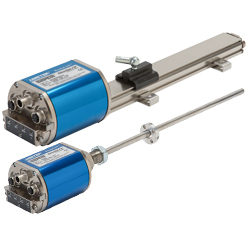 Our line of linear displacement transducers, also known as linear position sensors, utilizes advanced, proven Magnetostrictive technology to provide highly precise and absolute non-contact position feedback down to 1-micron resolution. The ReadyLink LDT is a smart device; it has a RapidRecall Configuration Module to help aid in the configuration of the LDT. The module can also be used to help configure the static IP address, and it has three rotary DIP switches that allow the user to configure how the IP address will be assigned. Furthermore the RapidRecall module can also store all user configurations. Once the LDT has been configured, these settings can be uploaded to the module. The Network LDT is available in two different package styles; the 953N is our Rod Style package that is suitable for installation into hydraulic cylinders and our 957N Brik Low Profile Style package that incorporates the same electronics but is housed in an aluminum style extrusion. The IP Configuration Tool is a powerful and easy-to-use tool that allows the user to view, change or save IP address information.